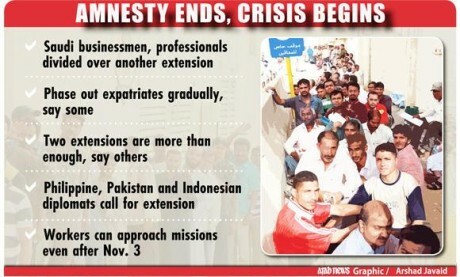 Amnesty Not Extended, Now What? Lots of illegal workers in Saudi Arabia expect to receive the amnesty extension but as of this writing no extension has been made. Nobody knows what will happen tomorrow, but for sure there will be lots of “bakala”, restaurant and other establishments will be closed due to lack of manpower and legal documentation. The government have expressed their intention to fully uphold the law and fine illegal workers as well as companies will be caught coddling illegal workers. Whatever happen tomorrow we would like to remind our readers not to go outside their accommodations without proper documentation. We hope that this crackdown will benefit us also expats in the long run.